These are a selection of skateboard trucks we have in stock if you are looking for a particular truck and we have not got it listed please contact us as we should be able to help. The Signature Truck of Pro-Skater Grant Taylor. Grant’s style is known to be fast and powerful especially in transition parks and bowls. 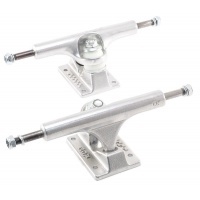 These super lightweight, yet extremely strong titanium trucks are a must have to strip weight away from your setup. Independent have been the leading trucks brand from the start. Here we have the classic RAW Indy’s in a range of sizes. Arguably the best trucks on the market! We have from 129 – 159 available. Theeve have some great names behind them with their pro team, and the quality of their trucks represents this. Here we have the CSX V3 in Raw which is a great looking truck. 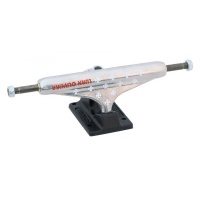 Thunder Trucks 143 Team Skateboard Trucks Polished Silver 143mm are ideal for smaller boards. 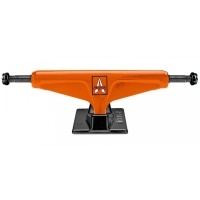 A great set of trucks for the small decked riders and groms. These 147 Trucks are ideal for a 7.90 - 8.125in Deck. 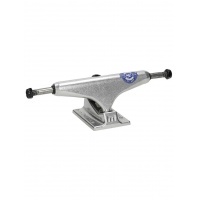 Precise control and hollow kingpin, alongside non slip axels gives these trucks a highly professional feel. The newest drop from Venture. These Spencer Hamilton Pro Trucks are no exception to Ventures top craftsmanship and attention to detail. 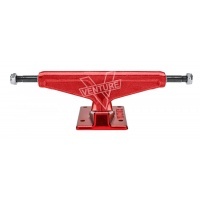 Venture trucks are regarded one of the lightest trucks on the market. These awesome looking trucks are loud, bold and certain to turn heads. 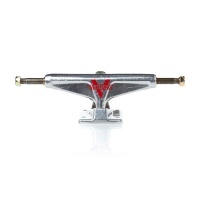 Venture has been one of the leading brands in skating for a long time, and with trucks such as these, it is clear to see why. They look and feel sick. We recommend these trucks for decks of a width 7.875in - 8.125in. The Wings Trucks have been the benchmark truck for Venture for quite some time now. The original lightweight, fast turning trucks from Venture. 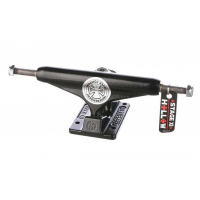 The Low Monochrome trucks hollow kingpins and forged baseplates support further weight loss, and extra strengthening. 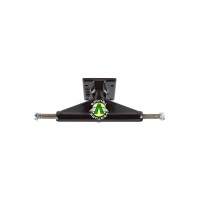 The 33s are a high truck and come with a low set kingpin, responsive bushings and a non slip axle. Ideal for grinding. 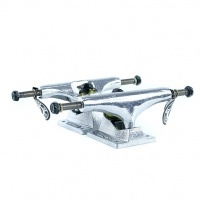 The perfect set of trucks for your first setup boasting a strong aluminium build with awesome styling in a raw finish. These baby blue trucks from Independent look incredible, but the pro's don't end there. Indy are and always have one of the leading truck brands in the world and its clear to see why. Luan's pro debut truck features a polished silver hanger and black basplate with the classic Cross pattern repeated graphic. The first choice for skaters since 1978. 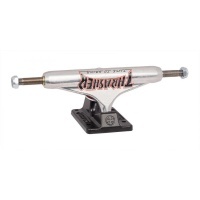 The Independent x Thrasher Pentagram Stage 11 Trucks feature new updated geometry. This is the new Standard. Super stable and a beautiful turn. These 149 Trucks are ideal for a 8.38-8.62in Deck. 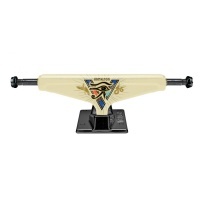 Precise control and hollow kingpin, alongside non slip axels gives these trucks a highly professional feel. The original lightweight, fast turning trucks from Venture. The Low trucks hollow kingpins and forged baseplates support further weight loss, and extra strengthening.